TORONTO -- John Muscat was asleep on Nov. 27 last year when he became intertwined with a historical moment that will be remembered for decades, if not centuries. Having hosted his annual Christmas bash the night before and planned to go into work late the next day, the Toronto-based fashion designer woke up to find dozens of calls alerting him that Britain's Prince Harry had announced his engagement that morning to "Suits" star Meghan Markle, clad in a white wrap coat from the knitwear brand Line The Label, which Muscat co-founded. The $799 coat solidified his place in an elite but growing club of Canadian fashion brands, including Sentaler, Mackage, Smythe and even Aritzia's Babaton brand, that have been catapulted into the international spotlight since the actress's engagement to Prince Harry. The designers boast that any time Markle appears in one of their items, it draws a flurry of new fans to their brands, setting fashion trends and often inspiring knock-offs. In the hours after Markle appeared in the coat, Muscat said Line's Instagram traffic tripled, the company website was "overrun" and he was seeing thousands of requests for the coat, which already was difficult to nab because it was the end of the season. "I ended up making 500 (more) just because I didn't want the entire world to be a white coat. It would take away the specialness," said Muscat. "It was about the moment and what it did for the brand, not about selling a ton of white coats." Though Line had been working with Markle for years, Muscat has never met her and didn't get a heads up about the outfit when he was putting together a selection of items for her to take with her to London. He chalks it up to luck that the couple chose to make their engagement appearance outside, on a day with good weather -- the kind of backdrop that would necessitate a coat like Line's. "There is a million different scenarios that could have happened. We are very lucky," he said. "This will not happen again until (Duke of Cambridge) William's children get engaged or married. In this century it has happened, what six or seven times, and we are part of that exclusive club now." It wasn't the first time Markle stepped out in his designs. In her "Suits" days, she was seen around Toronto in some of his sweaters and the engagement coat in two other colours. She was previously spotted in London wearing one of his leather jackets, and at the closing ceremony for Prince Harry's Invictus Games in Toronto in September, she was in the stands in a silk coat from Line. Within seconds of her making such appearances, fashionistas turned into super sleuths, tracking down who's behind every garment and accessory she's clad in and documenting them on fan sites with monikers like What Meghan Wore, Meghan's Mirror and Mad About Meghan. Amongst Burberry tartan coats, Alexander McQueen suits and Strathberry handbags, they've noticed a few Canadian touches: the 18-karat yellow gold and opal earrings from Montreal-based fine jewellery brand Birks she wore while announcing her impending nuptials; the burgundy jacket from Mackage, also of Montreal fame, she donned while at the Invictus Games' closing ceremony in Toronto last year; and even the twill trench coat from Vancouver's Babaton she sported at the Invictus Games trials earlier this year. She's also proven to be a big fan of Toronto-based womenswear designer Bojana Sentaler, whose $1,695 camel-coloured baby alpaca wrap coat she wore at church with the Queen and other members of the British monarchy on Christmas Day last year, and whose $395 classic wrap scarf in sand grey she's been seen shopping in. Sentaler said she's lucky that Markle's minimalist style is sprinkled with many of the same hallmarks of her designs: clean silhouettes and elegant yet feminine looks. "Whatever Meghan ends up wearing, it ends up selling out right away and then it goes on back order," said Sentaler. "Women get very excited to own a piece that one of the royals wore." 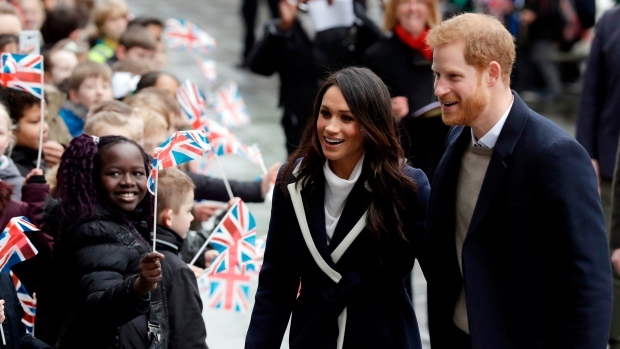 Ben Barry, Ryerson University's School of Fashion chair, expects those in their twenties and thirties or people who are interested in fashion, royal-watching and celebrity culture to be most attracted to keeping up with Markle's style cues, which could be valuable for brands. "She represents a specific lifestyle that will appeal to a certain customer, but to other customers she is totally inaccessible (with) that kind of wealth, that kind of privilege," he said. "People that might have a certain privilege, a certain lifestyle might say... 'I see myself in her, so I do want to follow her fashion choices,"' he said. Many of the Canadian brands Markle has championed have a European presence, but still have room for expansion across the continent, said Barry. "The U.K. is a major market in fashion so she presents an entry for Canadian brands into this really competitive but lucrative market," he said. "That's a huge opportunity." Whether she continues to put Canadian companies in the spotlight, remains to be seen, but Barry is optimistic. "Hopefully what she has done is develop a relationship with these brands because she likes their brand, their story and their values and will continue to wear them," he said. "If she sees her influence is putting Canadian fashion on the global map, particularly for emerging brands, maybe she will want to continue."